For the first time in M&S history, the kids have taken over. Our Marks in Time Exhibition has been re-curated by children and young people from around the UK. From selecting items for display, to writing unique labels, to creating film, pupils and learners have completely re-interpreted our collection - telling the M&S story in their own words. Pupils and learners in seven different schools and groups were allocated one of our display cases, and since January this year they've been working digitally with us to select archive items that they think truly reflect the relevant era. The children have also written labels to accompany their chosen archives. They were tasked with using both their creative and analytical skills - the results are insightful, imaginative, engaging and interpret the collection in a completely new way. This really is a unique way to view the Marks in Time Exhibition, and not to be missed! 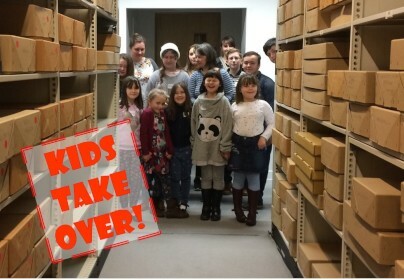 The Kids Takeover has come about as a result of the M&S Company Archive’s involvement in a wider initiative by Culture 24 encouraging children to interact and engage digitally with archives and museums across the UK. Kids Takeover is a temporary re-interpretation of the permanent Marks in Time Exhibition, our existing exhibition and audio guides are still available to visitors.